I don’t have a long argument or paper for you to review this time. Instead, I have random awesome science. The origins of triticale (and why the idea of quadrotriticale is awesome). Neat tiny ctenophores living on sea stars. What are ctenophores? Find out! Old people smell comfortable. No really. Don’t worry: this post is pretty short, by my standards. The “sniffers” more reliably identified a pad worn by an older person. When asked which odors they preferred, the sniffers tended to rate the older person smells as less offensive. So, old people smell better. Apparently. Or at least one study says so. The image of people sleeping in night clothes every night designed to absorb as much smell as possible amuses me. Next up, tiny ctenophores that live on sea stars. I’m a regular reader of the Echinoblog which primarily posts about Echinoderms which are the sea stars (starfish), sea cucumbers, basket stars, sea urchins and sand dollars of the ocean. I’m pretty much in love with the weirdness of echinoderms (plus, just say echinoderm a few times and you’ll love the word). Anyway, the Echinoblog just posted a post with an awesome video of tiny ctenophores living on sea stars. Ctenophores are fairly closely related to Cnidarians or the jellyfish, though different phyla. They are small jelly like things that filter or grab other animals out of the current to eat. In this video you’ll see a tiny ctenophore living attached to a sea star and waving its cilia about grabbing things to eat (tiny things obviously). Sea stars (and other echinoderms) are frequently habitat for other small sea creatures including shrimp, crabs, worms and even fish that live in the cloaca of sea cucumbers. So, echinoderms and other marine invertebrates are awesome. One of the best experiences I’ve had this year has been scuba diving and seeing them up close, including sunflower sea stars which are some of the biggest in the world. It’s pretty alien to float next to a giant many-armed echinoderm. Finally, triticale! I was (still am?) a Star Trek nerd. When I was eleven, I stayed home every day for several months during the summer to record on VHS tape every episode of the original series. You might be aware of an episode about tribbles. Everyone remembers the cute purring little balls of fur. But do you remember how the the tribbles saved the day? They ended up feeding on a store of seed grain called quadrotriticale that the Federation was planning to plant when they won the right to settle on a planet the Klingons were fighting them over. The Klingon agent had actually poisoned it and thus the Federation won the rights to the planet. Quadrotriticale was an obvious homage to triticale which is a real hybrid grain grown today. Triticale is a wheat and rye hybrid. I knew that part. What I didn’t know is that normally a hybrid between wheat (tetrapoloid) and rye (diploid) would be sterile because the offspring is triploid. But in the late 19th century, colchicine applied to the seeds was discovered to prevent chromosomes from separating during meiosis so you ended up with a polyploid, fertile offspring. Over the years various varieties have been bred. Triticale is considered a good compromise cereal grain that can grown in less hardy conditions than wheat. But have a read about colchicine, the chemical used to induce polyploidy. It’s used in many different plants and regularly in research. But plants are perverse (by mammalian) standards and will double their chromosomes and breed across “species” lines at the drop of a hat, even without chemical help. Wheat itself comes in several different numbers of chromosomes. Star Trek’s fictional quadrotriticale is described as being a high yield perennial (!) improvement on triticale. One of my favorite things about Star Trek is the unrelenting and optimistic belief that humans can improve our civilization using science and reason. 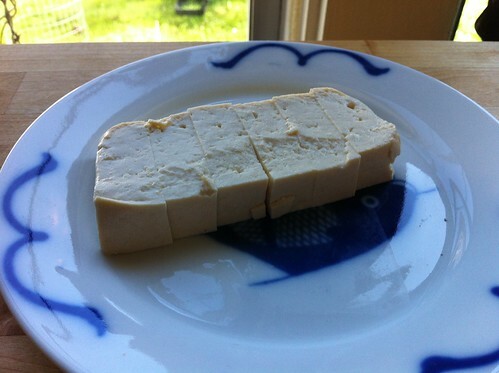 Today, I present to you something a bit less depressing: tofu! My partner, Adam, and I eat a lot of tofu. 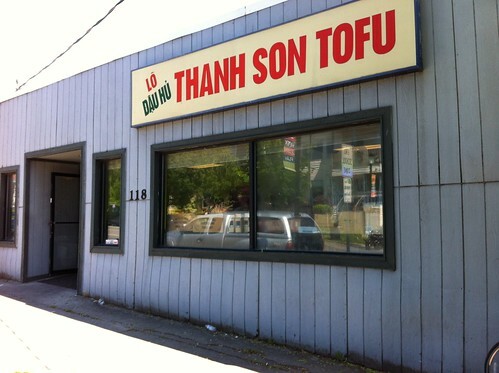 We’ve largely been purchasing our tofu from Thanh Son Tofu which is a little over a mile or so from our house (they are also carried at several local grocery stores including Uwajimaya). 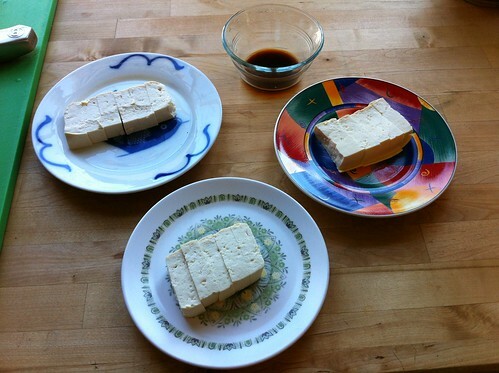 We’ve known about two other local tofu factories very close by as well so today we decided to get some from each and compare! Since it was lunch, we got some food from their steam tray (everything vegan! ): vegan chow mein with stir-fried tofu vegetables (bok choi, cauliflower, mushrooms, etc) and a container of red coconut tofu curry. Otherwise, we asked for a couple pounds of tofu which was cut off a large block sitting on a metal sheet pan, then packaged in a simple plastic bag on a tray. 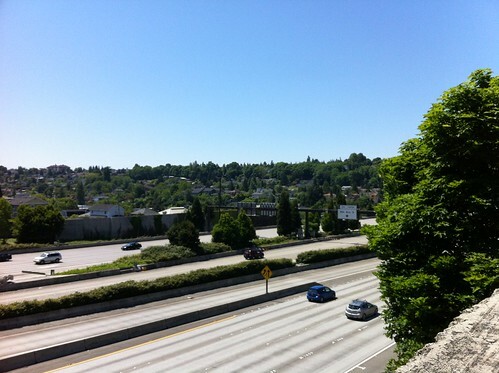 We ate our lunch on a bit of green space between Boren and Yesler. My curry was spectacular: incredibly rich coconut milk, spicy and the tofu was exactly right in the dish. The chow mein was a bit more pedestrian (except being egg-free), but all the veggies were fresh and cooked properly. 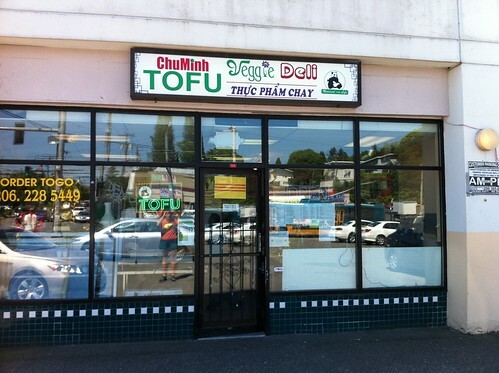 The tofu in it was obviously their fried variety cut into thin strips and fried with the rest. Tasty! Adam went in by himself because there’s not really a good place to lock up bikes. Apparently it was mobbed so it took a whole five minutes! 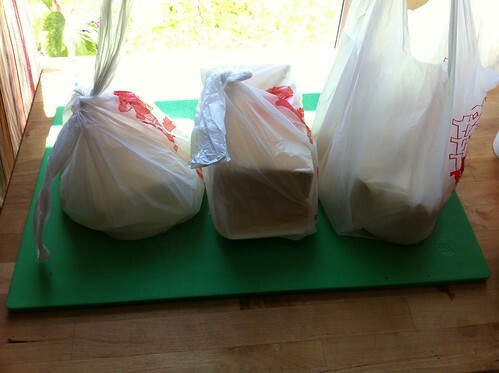 They sell other food (for takeout only) but we haven’t really explored that much. 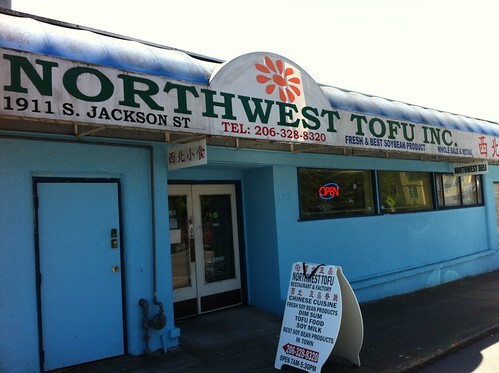 We usually just go for the tofu. He got three blocks, still warm. Northwest is definitely the most like a restaurant. When I walked in I was directed way to the back, down a hallway, to the very back of the building. They weren’t making any tofu but I got to see the works! Thanh Son does their work in a back room and you can’t really see it. I asked for two pounds from them and was offered two blocks. She came back with a watery bag with more squared-off blocks than Thanh Son and warned me it was just made so was still a bit soft. During the tasting, we cleansed our palates with fresh watermelon between tofus1. We each tried all tofus (only slightly chill) with and without a bit of soy sauce. A blind taste wasn’t practical unfortunately. Perhaps we could get some friends together next time. Both of us agree that all three tofus are much tastier and more interesting than supermarket tofu. The ChuMinh and Northwest were not as “beany” tasting as Thanh Son (to us this is a good thing, but your taste may vary). The ChuMinh was very, very smooth. The texture as it was eaten was almost like a puree or paste (in a good way!) It had a bit of calcium/chalk flavor but wasn’t terribly noticeable (soy sauce covered it easily, as would cooking with it). Adam noted that the ChuMinh, due to its firm but very smooth texture, would be really great in pureed mixtures (vegan dips, pudding, etc). The Northwest Tofu almost fell apart earlier but it had firmed up a bit after chilling (she did warn me it was really fresh!) It was smoother than the ChuMinh and had a very mild taste (though maybe slightly more chalky). 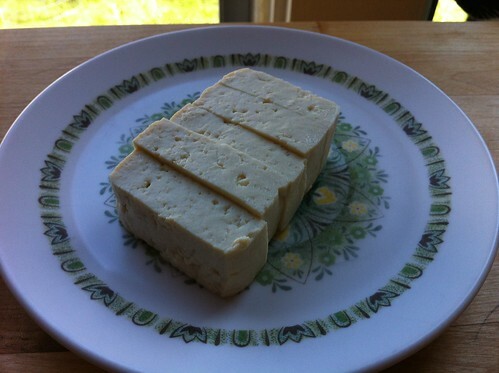 Adam commented it was the best for dishes that call for silken tofu. The Thanh Son, though, still has our hearts. It has a stronger taste that stands on its own, beany with almost no calcium or chalk flavor2. It was likely as fresh as Northwest’s, as it was still warm, but the texture is more firm and versatile for our purposes. When you eat it, it is not as smooth as the others, but it almost seems to break into many very small chunks. The beany taste, though, is probably what wins my heart. That said, all of these tofus can be eaten straight and cold and are interesting and tasty. 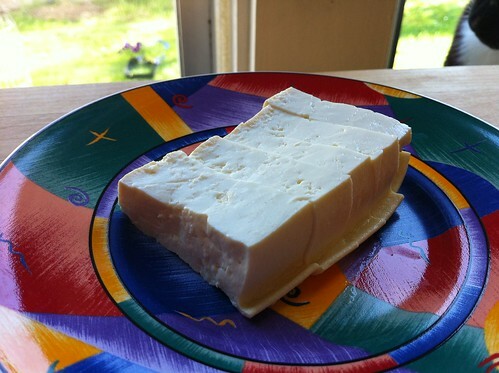 Until I had Thanh Son tofu, I had never found “fresh” tofu by itself palatable. So Northwest is by price the best deal, but only barely. In any case, they are all spectacularly cheap and delicious. Sometime we’ll have to make it at home. Clothianidin: Dangerous Compared to What? I recently spent some time in the comments on a Mother Jones post that was ostensibly about how a Bayer-produced pesticide is causing Colony Collapse Disorder (mysterious disintegration of bee colonies) and seed companies are conspiring to force pesticide seed coating on farmers. Some of the commenters were pretty challenging and I learned quite a bit about a particular neonicotinoid pesticide clothianidin. Like most pesticides it is actually pretty dangerous — and is increasingly looking particularly dangerous to bees — but like everything else in agriculture we have to ask how it’s being used and what it’s replacing. Update on 7/09 09:45: Please also see a newer post that considers whether clothianidin is really worth the cost. One commenter linked me to an article1 specifically about how clothianidin could be affecting bees more than previously expected due to unexpected exposure pathways. This was actually the first article I’ve read2 that was actually measuring real environmental exposures to a neonicitinoid pesticide. There have been several3 4 5 high profile studies recently that showed unexpectedly large harmful effects on bees. Two of these, however, are using estimated exposure rates based on other studies which seem somewhat problematic to me6 (the third is behind a paywall but does look like it might be actual measured exposure). They are still useful results — if a particular bee species gets this sub-lethal amount of a pesticide, then they have trouble with normal bee tasks. But a critical piece is exactly how much they are actually getting from agricultural use. All pesticides are going to have an effect on some animal, and often ones we don’t intend, so the goal is to find ways to minimize that exposure. This study actually describes how a pesticide — added as a seed-coating so that it will continue to work against pests as the plant grows — may be exposing bees to more of the pesticide than expected. This is extremely interesting to me because a major advantage of seed-coating is that it reduces environmental exposure. Relatively small amounts coat the seed and they are translocated throughout the plant as it grows, ideally only affecting pests that eat the plant itself. The seeds studied here are corn (maize) which is wind-pollinated and it wasn’t expected that bees ate all that much of the pollen. What they found was first that bees were eating a lot more corn pollen than expected. Since the seeds were treated with clothianidin, the pollen had some clothianidin, specifically 3.9 parts per billion so the bees were consuming a fair bit of poison7. Later in the season, when planting is largely complete, we found that honey bees will collect maize pollen that contains translocated neonicotinoids and other pesticides from seed. Translocation of neonicotinoids into pollen has previously been reported for maize grown from imidacloprid-treated seed , although the degree to which honey bees in our study gathered maize pollen was surprising. More interesting to me is that the pesticide-coated seeds have to be coated in talc before planting to keep from jamming the equipment. The residue talc and dust was contaminated with pesticide (anywhere from around 3000 to 15000 parts per million) which they postulate could be falling on other flowers that bees forage on which the authors see as a significant risk of exposure. Both soil and dandelion flowers obtained from the fields closest to the affected apiary (soybeans in 2010, unplanted when sampled in 2011) contained clothianidin (Table 6), therefore clothianidin in/on the dandelions could have resulted from translocation from the soil to the flower, from surface contamination of the flowers from dust, or a combination of these two mechanisms. Dandelion flowers growing far from agricultural areas served as controls; no neonicotinoids were detected. You might think from reading this that we should ban this pesticide immediately. But that seems premature to me. First, the authors themselves note that better handling of talc and dust residues could remove 99% of the risk from that exposure route. A recently published review of the risks posed by planting treated seeds in the E.U. estimates that measures taken there may reduce the dust generated during planting by 99% . In North America, different planting equipment is used and there are currently no guidelines for disposal of waste talc, nor are there devices for filtering exhaust material from the vacuum planting systems. Producers may be largely unaware that this material is highly toxic to pollinators. However, given the unprecedented levels of maize production across the United States, coupled with the increasing adoption of neonicotinoid seed treatments in other annual crops covering a wide area, including soybeans (31.3 million ha), wheat (24.7 million ha), and cotton (4.4 million ha, all figures 2010 planting) , it is clear that this material presents a risk that is worthy of further investigation and possibly corrective action. Maize pollen was frequently collected by foraging honey bees while it was available: maize pollen comprised over 50% of the pollen collected by bees, by volume, in 10 of 20 samples. So it’s pretty clear this pesticide is harmful to bees though (whether it’s strongly relatd to CCD or not is pretty unclear and this paper does not describe CCD effects). Clothianidin was definitely known to be harmful to bees when it was conditionally registered, though these methods of exposure were not. Do these exposure routes mean it should be banned? Neonicotinoid pesticides only became common in the 1990s (clothianidin was only given conditional registration in the US in 2003). The alternatives are organophosphate, carbamate and pyrethroid pesticides (these are of course still used as well for many different uses). The neonicotinoids appears to be less toxic to a large numbers of animals, including mammals, which gives another reason to use them (a major risk of working in agriculture is significant and harmful pesticide exposure). Pyrethroids are extremely toxic to many aquatic organisms at very small concentrations. Organophosphate insecticides are extremely harmful to insects and humans. Both organophosphates and pyrethroids will kill bees merely on contact: unlike clothianidin the bees do not have to eat them to be harmed. Clothianidin was initially approved (partially) because it has lower risk to mammals and birds. Coating seeds with it is yet another way to reduce the harmfulness of what is applied (since there is far less of it) and because it’s less likely to run-off into waterways. We haven’t as a society banned every other pesticide and yet many of the others still used are extremely harmful: to bees, to insects, to aquatic animals, and so on. Modern agriculture is very dependent on pesticides to maintain good yields with little damage to the crops. If corn seeds aren’t coated with this pesticide, then farmers will attempt to control the pests in other ways. This might involve spraying throughout the season, with greater amounts of pesticide and likely with more broadly harmful ones. I see the last few decades of agricultural science as a period of finding ways to decrease harm while still producing truly staggering amounts of food. One of the ways we’re doing that is by creating plants that can fight off their own pests better. If you’ve never heard of “Bt corn” or the phrase “Cry1Ab protein” before, I recommend this primer. So right now we only have plants that can fight off only a few organisms. The pesticides (proteins) generated by the plant are fairly specific but limited. They don’t harm humans when eaten or the environment with runoffs. Unlike seed-coating, there’s no contaminated dust or talc to contaminate other plants. We need more of these. But if you don’t like the idea of killing pest insects, researchers are finding ways to just “scare off” pests. But the common element of both these general techniques is that we apply less pesticides that affect broad swaths of animals, pests or not. If we increasingly target our pest control only against pests affecting our crops, then we’re less likely to affect other organisms. We need to fix the known problems with clothianidin. But I can’t say from this evidence that we should stop using it entirely. The EPA has communicated what evidence they need to see to take it off the market. It reiterates that clothianidin is far less harmful than alternatives it replaces, both to bees and humans. But clothianidin isn’t really the point. The point is that we’re still mostly using broad-spectrum chemical pesticides when we should be targeting pest controls much more narrowly. Genetic engineering, as with Bt corn, is a technology we should be expanding. Conscience rules for what government funds are complicated and unworkable if we treat everybody’s conscience fairly. Let’s stop treating the moral objections of those who oppose abortion as special. Regular news updates from my NPR radio affiliate remind me that certain segments of our political conversation are still obsessed with the idea that the government can never, ever spend taxpayer money in a way that, even indirectly, might allow an abortion to occur. This is (ostensibly) because it’s wrong to force a person who believes abortion is murder to pay for one. While I am sympathetic to the idea that there is a (small) wrong occurring when people are forced to pay for something that they believe is morally wrong, the idea that this should stop the government from funding something is obviously unworkable if extended beyond the most commonly claimed issues (usually abortion). For example, I consider capital punishment to be morally repugnant. But, I’m forced to pay for it. I also consider subsidizing the activities of oil extraction companies that operate in the Niger Delta to be repugnant and bad foreign policy. I find a lot of things my government does with my tax money to be repugnant. But I don’t think my personal moral objection means the government can’t possibly fund it and everyone has to take my objections extremely seriously. The only thing my moral objection gives me is a position to convince others and hopefully change the behavior of my government. If everyone’s moral objections as to what the government shouldn’t fund were taken as seriously as abortion, then the government likely couldn’t spend money on anything. But for some reason abortion is different. Can’t the media and the public conversation stop giving special status to “the abortion question” as if that particular moral issue is of such great weight that any story about the Affordable Healthcare Act, Planned Parenthood or similar has to quote someone objecting to paying for abortion with public money? Over a third of Americans oppose the death penalty. That’s more than those who oppose abortion in all circumstances. Let’s stop pretending the government is wrong to make people pay for something they think is morally wrong. The government does so regularly. Government would be unworkable if the moral objections of a minority always trumped public decision-making processes. Anti-abortion advocates may be able to stop the government from paying for abortions, but they do so with no more moral authority than anyone arguing against any particular government policy.